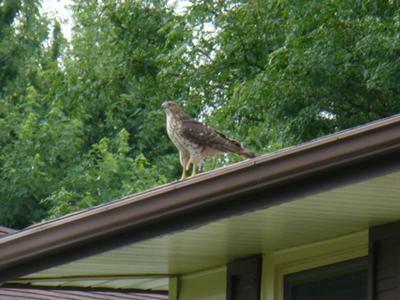 We noticed a hawk in our backyard over the last few days. Today we had quite a treat with 3 in our backyard at once. So we think it may be mom with her young (although they look very big). Here is also a photo of 2 of them together, I hope the picture is too large for the site. Please let us know what type of Raptor this is? Thanks so much for your submission to our site, and the great pictures - maybe one of our readers might know what type of Hawk this is, so if anyone can identify this bird, please let us know. Meanwhile I will check my "Bird Books" and see what I can find out - Thanks again! 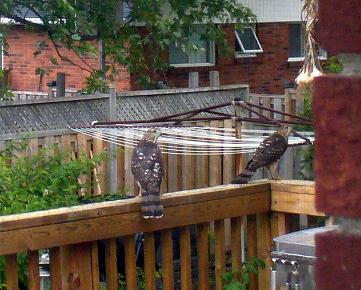 They are Cooper's Hawks - I have them here - those seem to be immatures. If it was an adult Goshawk it would be grey and have (red eyes) but these aren't as big as a Goshawks, almost though! Wow - how neat was that? I think that the first response is correct and that they are northern Goshawks - thanks for posting. I'm not 100 percent sure, but from the marking I can see on the tail and it appears to have the reddish eye and the right coloring, I would think it is a Northern Goshawk. Wow, pics are amazing! I'm no hawk expert by any means, but I had to share that we just had one for the first time today in our backyard, just as close as yours on the railing of our deck like you. I was sitting on our couch, so about 2-1/2 yards away from it. The hawk that landed here was a lighter colour brown on the wings than the ones that you've had. We live in a townhouse complex and feed birds. There are also tons of squirrels around and we have the odd rabbit. There's a mouse or two at night that go after the feed that drops from feeders. We also live by a creek, so there are fish and mature trees where they could hide if they want. We've been here 20 years and have never seen one around this proximity. Having looked online, it seems that there are so many different species of hawks; it's hard to know what kind yours might be. I have no idea what kind ours was either. I now have my camera so I can take a picture next time.